Unless it is an emergency, for which you do not need and appointment, we request that you obtain a referral from your regular veterinarian and that he or she provide us with background information concerning the animal and the suspected problem. 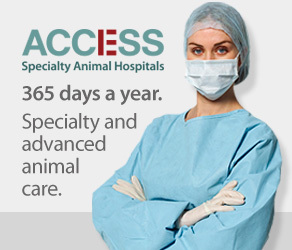 Where can I find more information about veterinary specialists? Why should I be referred to the specialist? There are many medical and surgical problems that are best treated through visits to a regular general practice veterinarian. Our practice is a resource available to general practitioners. Our principal services are in those areas that are highly specialized and for which your regular veterinarian may not have specialized training or current specific knowledge. In order to provide you and your pet with an unhurried visit and comprehensive consultation with the doctor, please leave home or work early and allow plenty of time to reach our clinic. If it will be your first visit, allow 15-20 minutes prior to your appointment time to complete new client paperwork. Do not assume that the freeway traffic will be clear. We normally are fully booked for each business day. If you are late for your appointment, we may not be able to accommodate you until another day and may therefore ask you to reschedule your visit. Therefore, if you are going to be late by more than 10 minutes, please call us as soon as possible so that we may advise you of whether or not your late arrival can be accommodated. Please note: Your appointment time is reserved exclusively for you and your pet. If you need to cancel or reschedule your appointment, please call us as soon as possible, so that we may help another patient in your pet’s place. If you are calling after-hours, please call our main number and follow the voice mail instructions to leave us a message, or to cancel an appointment. Our staff will be pleased to discuss our examination and visit fees with you over the phone when you call us. Legally, and in order to provide you with accurate information, we cannot provide you with medical information, diagnoses, or treatment options unless a complete medical examination of your pet is first performed. In the event that further diagnostic or treatment is necessary, you will be provided with a comprehensive printed estimate for the services offered. Will we refill prescriptions if the last clinic visit is more that a year ago? Please note that if you are on vacation and are not in the state of California, we cannot call a prescription refill into a non-California pharmacy. If you are out-of-state and you need a prescription refill, you will have to visit a veterinarian or veterinary specialist in that state in order to be able to obtain medication(s). Please plan ahead accordingly. [/accordion_toggle] ArrayWe do not make any recommendations regarding your selection of a general practice veterinarian. However, if you are one of our patients and you do NOT already have a regular veterinarian, we may provide you with a list of referring veterinarians that have practices in your ZIP code area. Where can I get more information concerning the doctor’s diagnosis? We have numerous client handouts that are disease/problem specific. At the time of your appointment, we can provide you with a copy of the appropriate handout(s) to assist you in learning more about a particular disease/problem. What does Board Certification of our Specialists mean for your pet? An estimate of expected charges is provided to each client at the time of the initial consultation. Fees are assessed only for services provided and do not include prepayments for future visits, recheck examinations, or post-operative follow-up. Since this is a private veterinary facility, payment is required at the time services are rendered. For client convenience, payment may be made in the form of cash, check, Care Credit, Mastercard, Visa, Discover, or American Express credit cards. Appointments for examination and consultation with the Critical Care, Cardiology, Internal Medicine, Neurology and Sugery departments can be made by calling 818-887-2262. To be thorough and complete, the initial visit with the specialist may require 2-3 hours. Copies of the patient’s medical records, radiographs, electrocardiogram (EKG), and blood work should be brought for the examination. If your pet has been receiving any medication, bring the medication at the time of the initial consultation. We encourage that our patients be currently immunized and free of parasites however, we understand that due to the nature of emergency medicine, vaccines are sometimes not up-to-date due to a patients age and immune system. What Anesthetic safety is performed? For maximum patient safety, a complete blood screen is routinely performed on all patients scheduled for anesthetic procedures at ACCESS. Often this blood and urine screen may have been performed by your pet’s family pet practitioner prior to referral. All anesthetized patients are closely monitored with state-of-the-art monitors. Anesthetic risk is further minimized by the use of the safest anesthetic agents and protocols. We believe the added cost of these agents is well worth the added safety that a much loved member of the family deserves. What care is given to pain management during hospitalization? Optimal patient care is best achieved by the high standards of care and high staff to patient ratio that ACCESS provides. Special attention is paid to the control and management of pain in all our patients. The latest pain relief medications and protocols are used in patients to control pain from debilitating conditions and to control pain during and after surgery.